FireBox LPD HF new hand fired systems are particularly suited for operations with extremely low labor cost environments. These systems to provide a flexible and reliable operation utilizing a wide range of biomass waste with moisture contents ranging from 8 – 50% and requiring minimal fuel preparation. Ash removal is a manual operation. The boiler vessel is a two pass hybrid design incorporating a water tubed boiler-type water membrane and a two-pass fire tube scotch marine vessel. Along with a three-pass fire tube firebox design that inherently provides an extended water membrane in the furnace area greatly reducing the amount of refractory required. The Firebox LPD HF design is suitable for applications to produce low pressure steam or hot water in ranges from 3,450 - 20,700 lbs/hr (3.4 mm BTU - 20 mm BTU) output at 15 PSI steam or 30 PSI hot water. 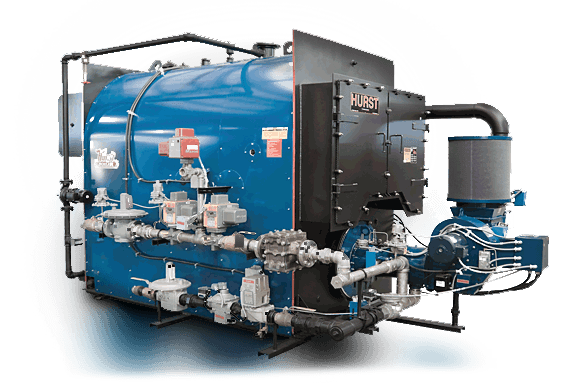 This system is designed by HBC to combine the best technologies from the "old school" of biomass combustion and the latest advanced combustion control technologies. Firebox LPD HF can burn biomass fuels, woody fuels, forestry residues, mill residues, agricultural residues, urban wood and yard wastes, dedicated biomass crops, chemical recovery fuels, and dry animal manure.